Are you looking for inexpensive gifts to stuff into stockings, give to family, friends, co-workers, or teachers? Here is a list of affordable items that can help people stay organized. Neon luggage tags are durable, highly visible on your baggage, and make it easy to update your contact details. Add one inside the suitcase with your travel details and contact information in case the airline barcode tag gets ripped off the suitcase handle. Measure conversion wall art vinyl decals stick to any smooth surface. Decorative and useful for anyone who loves cooking (or who, like me, grew up learning only the metric system). Apply them to walls, or outside or inside kitchen cupboard doors. This set of 126 chalkboard labels come with chalk markers. They are great for bottles, jars, drawers, or bins. Small clear containers and small woven baskets are ideal to organize drawers, desktops, or just about anywhere. There are at least 50 ways to use a basket. 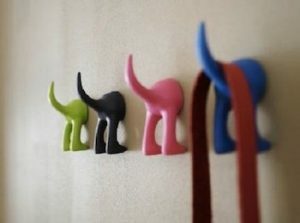 Hooks in the shape of dog tails are a cute way to make sure your pets’ leashes and collars stay in one place. They are available in pink, blue, and green. To help cyclists stay organized, this storage container in the shape of a water bottle holds tools or snacks and fits neatly in a water bottle holder eliminating the need to install a saddle bag. Whether surfboarding or snowboarding, this waterproof pouch will keep your keys and wallet dry and secure. This weekly/monthly agenda is undated so you can start planning any time of the year not just on January 1st. Besides jewellery, this 32-pocket hanging organizer could also be used to keep all sorts of toys, trinkets, or coins in order. Craft and office supplies, jewellery, nails, screws, and other hardware can be sorted and stored in these lidded boxes with built-in, adjustable dividers. This expandable mini filing pouch can organize and store coupons, receipts, business cards, and even bandages. These bold, colourful, pre-printed stickers are easy to add to any calendar. They help remind parents of appointments, school holidays, etc. — and no more writing the same thing over and over again! The gift of organization is always appreciated but it doesn’t have to be expensive. We hope this list has given our readers some inspiration. 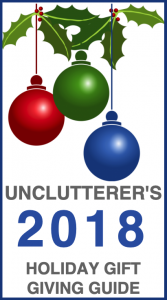 Feel welcome to share your best and least expensive organizing gift ideas.